This was a lovely meal with ripe tomatoes and basil. I used 2 cloves of garlic, and we gobbled it up. I have never made such a successful raw tomato pasta sauce. This was simple, tasty enough, and uses a fair amount of zucchini. Or anyhow, I increased the zucchini/squash to 1 lb, salted zucchini while sauteeing and salted couscous while steaming, and added 1 tsp or so of turmeric to the couscous water for some color. I served it with poached eggs on top to make it a meal. Delicious. Fast once everything was prepped. Used a Meyer lemon, used all the juice, added hot sauce, used scallion greens as well as white part, added a green garlic. Didn't have any ginger. Used soba noodles. Subbed lovage for cilantro and just sprinkled it on at the end. Next time, put white part of scallions & garlic in pan for a couple minutes before asparagus. One part cooking course, one part kitchen reference, and one part foolproof recipes, The Complete Book of Pasta and Noodles tells the story of flour and water like no other book on the market. 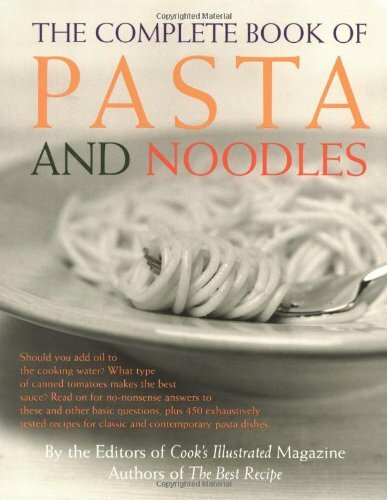 Extensively covering the basics of pasta and noodles, this thoroughly researched and taste-tested guide is dedicated to the home cook who needs practical advice on everything from penne to pad thai. The experts at Cook's Illustrated present their knowledge and techniques in a hands-on way so that each and every step of the cooking process can be understood and easily executed. The authors leave room for interpretation and taste, of course, but you will not walk away from this book without knowing which olive oil to buy, why egg pastas tend to complement cream sauces, or how to mince garlic. 365 Quick Tips: Kitchen tricks and shortcuts to make you a faster, smarter, better cook! How To Cook Chicken Breasts: An Illustrated Step-By-Step Guide to Foolproof Grilled, Broiled, Roasted, Sauteed, Baked, and Stir-Fried Chicken Breasts and Cutlets.